Day - Day of the week (Monday - Sunday). Person - Total number of live answers during a particular day of the week. Answering Machine - Total number of answering machines detected during a particular day of the week. No Answer - Total number of calls not answered during a particular day of the week. Busy - Total number of busy signal calls during a particular day of the week. Fax, Modem,... - Total number of fax, modem devices detected during a particular day of the week. 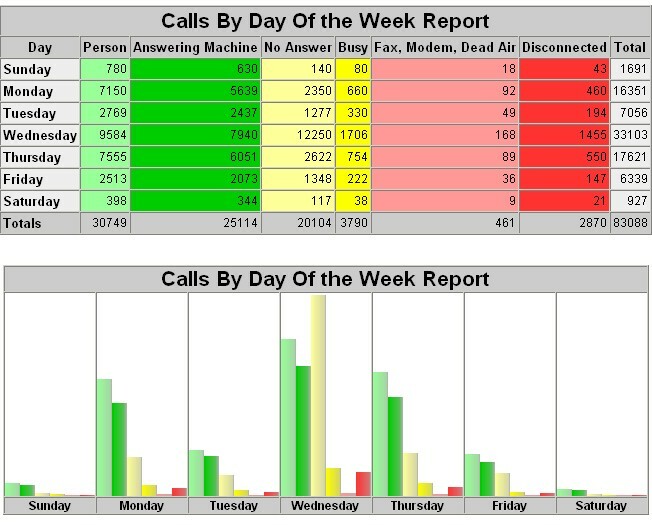 Disconnected - Total number of calls disconnected during a particular day of the week. Total - Total number of calls during a particular day of the week. For further information about our online reporting system, please contact us. DSC can provide these and any additional custom reports that your organizations requires. Contact DSC for a FREE analysis and quote and to learn more about our voice broadcasting products and phone reminder services. .